This photograph was taken at my front doorstep during the snowfall on 5th January 2010 at 22.00hrs. Twenty photo's were taken within 5 minutes. In Photo No.2 appeared a ghostly image which has & spooked & excited my family & I. Below, I have explained how the exact events took place leading to this strange happening.. I was very ill this day; sufering from a asthma combined with a chest infection finding it difficult to breathe. I was in the bedroom playing the guitar: At around 22.00 or just after, my wife Jessie came to me and said "Come on, lets to go out and check out the snow"
For a second I hesitated whether to go or not; then said "mmm OK lets go"
I grabbed up my digital camera (Casio Exilm 5.0 mega pixel) and followed Jessie downstairs. I opened the front door; Jessie stood behind me. The two of us faced looking outward admiring the view; the snow falling and settling in the silent well-lit street. I took the camera out, turned slightly to the left and snapped the first photograph. I had a look at the screen to see how it came out, then turned to the right, raised & stretched my arms out straight, above head level to get a shot just above my car. I noticed on the camera display a white misty figure. I swore "What the ...." Immediately I called my wife who was about behind me "Jessie Jessie, check this out"
She replied" Oh my God!" Within 10-15 seconds I took the third photo in the same position/angle, but the photo was fine. In the five minutes that followed, I managed to snap another 17 photographs (until the battery died) in the same direction & surrounding area to see if this image would appear again but all the photos were fine. I checked the road; there was no strong wind, just a light breeze; nobody was around, the street was completely empty & car engines were turned off, there was no smoke or steam. The response has been amazing with positive & negative feedback from friends, family, colleagues at work, neighbours & the general public, paranormal groups, facebook & journalists.. Some people say it is done on photo shop; it's gas, smoke, steam, condensation, breath or a reflection. Surprisingly more people believe that it is a spirit materialising/manifesting.. Just a few examples of what people think it is; good & bad spirit, angel, nun, grim reaper, guardian angel, phantom, captured an a moment in time, something in another dimension, alien like figure, a Jinn(arabic spirit) some say they can see a dog? I know it may sound crazy & unbelievable to many.. but this is the way it happened. 1. The image on the photo is too defined & well constructed for it to be smoke, breath, steam, and condensation. 2. I was short of breath; I would have had to breathe out over two feet in front & above head level to get my breath to the camera. 4. The timing from photo 1 to photo 2 and 3 was quick & sudden. 5. We took a few photos with breath & smoke but they were too smoky and not defined & nothing like the image. 6. In the same instant as I snapped, I felt a very fierce breeze/force across my face; like a hand held against my face, forcing it to the right, pushing my left cheek in. I had to almost shut my eyes & for a couple of seconds I was stunned; I could not move my head. It like something went through me.. I was not facing the camera when I took the photo. 7. Who or what was the breeze/force? 8. There was calm, only a very light breeze when I stepped out in the driveway & road, no smoke, steam, gas, or exhaust fumes? 9. If it was breath, why is it not in the other photos? 10. My wife was about 2 feet behind me when I took the first few photos; it's definitely not her breath. Spooky, strange, weird or wonderfull? What you have is your shadow cast on to the falling snow in front of you from the light behind you. Scared the devil out of me the first time it happened to me. Easier to see in a heavy fog. I just posted a comment. I just wanted to add, I'm not saying it was intentionally faked, just saying that I have a ton of 'oops' photos I have taken. There is condensation on the lens because I go from warm to cold or vice versa too quickly. I take a photo out a window with a screen in front of it, or a photo through a window with the flash not turned off. Breath can do this, someone smoking a cig. I have taken digital photos on purpose just like this - right in front of my friends- to prove how easily you can mess up a photo without even meaning to and they still ask me "are you sure"? We want to believe so we find things in photos to prove they are there. Not malicious deception, just wishful thinking. You have got to be kidding me. What kind of cheap trick shot is that c...? I congrats you for having the courage to be able to move, I would have freaked out. That's very cool, the misty thing kindof looks like it is about to slap someone and you say you felt something touch your face... spooooky! Well the pic could possibly be mist or even a snow drift. But for the most part is it looks too formed to be done on purpose. You may have great proof. But I am a little of a skeptic and when it come's to things like these It has to smack me across the face before I believe. Any case though you have a great proof and I don't doubt you. They say the people that don't expect get the unexpected. That Picture! it's truly fascinating! I have done research on a website called ghosts and angels. That picture you have there, might be an angel! Really fascinating! That picture you have there is a great blessing. I really thank you for submitting that pic of yours, it really helps with my research. Not trying to be mean or anything, it's just that I don't believe that ghosts in forms such as orbs, Mist, or blurred pics. Caitlin. Well it does look like just a steam or mist, I won't believe it if you give me proof, just send a website or something to prove me wrong. Caitlin. Caitlin.. Nice try to debunk it, but in this case you are very wrong! I would never have shared my true story without doing my home work first. It may look like breath to you, but millions will disagree. You can look for ghost pictures through your entire life and contemplate. I have had this analyzed by paranormal and non paranormal EXPERTS in this field & line of work. Paranormal photographer & film maker Chris Halton of 'Haunted Earth' said it is too well constructed & defined to be cold breath. Berkshire paranormal group say it may look like breath but are still stumped. 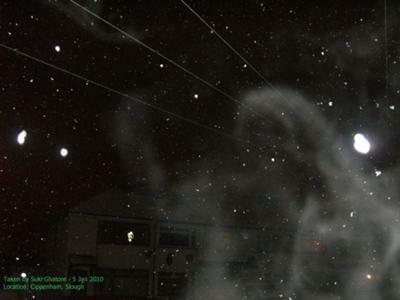 Thames Valley paranormal group's cameraman said "The more I look at this photograph the more paranormal it looks." * Thank you for sending the original and for the details that you included. I agree that it seems too well-defined to be breath, smoke or fog... my first reaction was that it resembles the figure of a Nun or other female figure. Have you experienced any activity before or since that night? After downloading and viewing/manipulating it in Photo Studio, I personally believe it to be authentic. At the very least, it's truly a unique photo with a unique experience to accompany it. * Suffice to say, I believe that picture to be authentic and it is definitely unique, as well as was the experience. There's definitely something in that picture and I would deem it as paranormal, at least by the specific definition.. "above the realm of ordinary experiences". The picture is extra-ordinary. Is it a "ghost"? spirit? energy? Again, we all have own beliefs and you have done a good job dispelling other possibilities. So Catlin.. I think you need to do your home work. The conclusion to this is that spirits & entities can come in many forms; sometimes they may look like breath, steam, smoke, mist, light... Who knows? Ummmm...it's your breath and steam coming outta your mouth....when I use my camera it does that. I know, I live in Canadian Arctic come on...plus I can tell from a real ghost to a non real ghost but nice try. I've been looking at ghost pics for years....so yeah it's just the steam coming outta your breath I mean what did you do? stop breathing and take a pic? Thank you for this photo. Perhaps there are answers to your questions here.